I absolutely love a good throw pillow, especially now that the weather is changing. When lounging or lying down, a nice fluffy pillow is the best to keep your body or head in the most comfortable position. Other than comfort, throw pillows can be great decorative pieces. They come in all different sizes, shapes, patterns and textures! I love that they can instantly update any couch, sofa, armchair, bed or anywhere in your home. So, how do you choose the right throw pillow? There is no right or wrong answer, but here are three simple guidelines to help you along the way. Keep in mind the color of the furniture. This will help you choose the colors, patterns, and textures of your pillows. I've read some of the "rules" to follow when choosing the right pillow, but remember that the most important thing in this process is to have fun! Don't over think it and choose your own unique style. 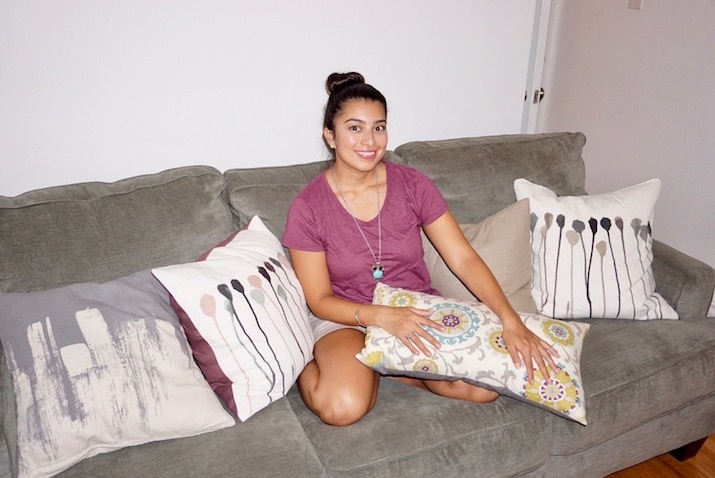 What are some of your throw pillow tips?